If everybody looks at you like you're crazy when you tell them your business idea, congratulations. You might be on your way to becoming a bona fide entrepreneur. Just being young, innovative and your own boss does not make you an entrepreneur, says Daniel Isenberg, an adjunct professor at Columbia Business School. And if everyone thinks your startup idea is wise and logical, then you are almost certainly not one, he says. "In order to create and capture extraordinary value, you almost always have to be contrarian," says Isenberg. "You enter the market when everyone else is leaving." 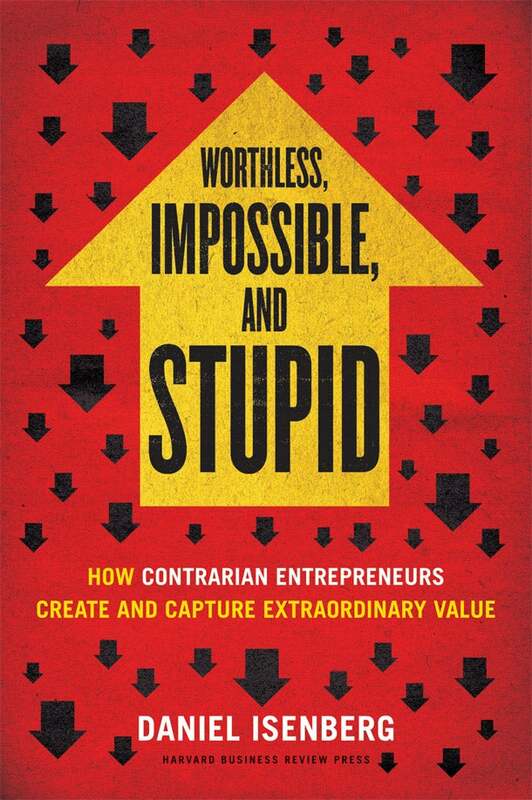 Ideas of truly successful entrepreneurs are often at first considered ridiculous by the majority of the public, Isenberg says in his new book Worthless, Impossible and Stupid: How Contrarian Entrepreneurs Create and Capture Extraordinary Value (Harvard Business Review Press, 2013). Often, self-employed people call themselves entrepreneurs because they are not working for a boss, says Isenberg. But business ownership is not sufficient to define an entrepreneur. "They may just be sort of plodding along," he says about the interviews he conducted with entrepreneurs from Alabama to Islamabad. And while Isenberg sees nothing wrong with being a small-business owner, he says only 1 to 5 percent of small-business owners are truly entrepreneurial. The word "entrepreneur" is often used to describe intentions, he says. For example, an "entrepreneurial thinker" is someone who identifies opportunities or approaches a task creatively. But to be a true entrepreneur, you must not only think about ideas; you must act on them, according to Isenberg. "It is about actually generating results that are more than the market expects," he says. Ironically, a contrarian entrepreneur can't be identified until after his or her idea has been absorbed or rejected by society, says Isenberg. "In a sense, it is the entrepreneur's job to surprise us, to surprise the market," he says. "There is a certain aspect of entrepreneurship that is unpredictable." That unpredictability makes it difficult to develop public policies to support entrepreneurship, adds Isenberg. For entrepreneurs, Isenberg says the key takeaway of the book is to have confidence and get used to being an outlier. It's important to learn to cope with the adversity, resistance and derision of the market, says Isenberg. "This is a normal part of the entrepreneurship experience." There are no resume requirements for who will make a successful entrepreneur, but there are a few similar traits of true entrepreneurs, says Isenberg. Namely, they tend to display a willingness to think independently, work hard and persevere, and seek excitement. Most of them held jobs when they were young, so learned the value of hard work early on. While the common characteristics of entrepreneurs are noteworthy, they don't define every entrepreneur, says Isenberg. Entrepreneurs are born all over the world, come from different socio-economic backgrounds and start up in a variety of industries. "It's not about Steve Jobs and Silicon Valley. It's about the kind of entrepreneurship you can see anywhere, whether it is Slovenia or Brazil or China or Iceland," he says.